"Come visit and live it"
We enjoy hosting visitors from around the world and across the country. 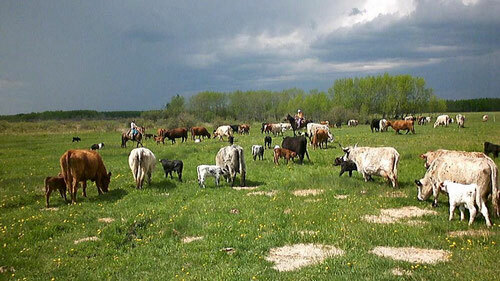 We would be glad to show you rural Western Canadian hospitality and culture. We like to have our volunteers stay for 4 weeks minimum, if they are interested in working outside. However, if you only have a short holiday planned during the winter, we will try to accommodate helpers who may wish to stay for less than a month. We do not require a minimum stay if someone wishes to only be involved in household tasks. We raise cattle for sale as beef. We use horses to work with the cattle. The horses are used for equestrian education, trail riding and equine assisted learning as well as ranch work. In recent years we have less chores for the winter, so fewer volunteers help us through the winter months. We appreciate having volunteers come in early spring to work with the horses, get fences fixed, learn about the cattle and then stay for the calving season if this fits into their plans. We have had quite a few exchange students stay with us for 4-6 months, work/travel volunteers who have stayed for several months and an I.A.E.A. trainee who stayed for a year. We anticipate that there will be many volunteers here in the spring, summer and into fall. We have accommodation for 2 people during the winter, or 4 during the summer, so we are limited by sleeping space as to how many folks we can host at one time. Check out the Map under Contacts - use the hybrid version to get the best picture! Winning Ways is located in the boreal forest of Saskatchewan; if you look at the map of our province you will find us located about 1/2 way up on the west side.This area has many trees and lakes as well as some farm land. Since we are ranchers, we do not grain farm any land. What is the weather like at Winning Ways? Winter is fairly long - snow comes to us sometime in November (even October) and leaves in April. Of course there are exceptions to this pattern but that is the best prediction we can give. Snowfall can be as much as 80 - 90cm but is usually around 60cm for the entire winter. We experience -40C at least once every winter although one year we had the dubious distinction of being the coldest place on the face of the planet at -60C. That only lasted a few hours thank goodness! Once it gets down to -40C you really can't tell how much colder it is. The last few years it has not been cold for extended periods. During the winter of ’06-’07 we did have a very nasty blizzard, the likes of which we had not had for about 50 years. I'm not trying to scare you, just warning anyone that has not seen a Saskatchewan winter, that it is a whole new experience! Spring is a great time of year when the snow melts and the fields and trees turn green. We can have +20C in April but it is usually not that warm until May. However, there are occasional snow storms in May which can be very devastating to new born calves! Those freak storms can cause ranchers a great deal of headache. Spring is busy on a ranch, there is the daily work with the cattle and horses as well as the maintenance of yard and fences, without having to dry out and warm up calves! The days grow longer until we can work outside until 10 p.m. in June. Summer may be very hot (we can experience +33C or more) and dry or fairly cool and wet. The growing season in this part of the world is relatively short, sometimes just over 60 days are frost free, although 90 - 100 days is more common. The humidity is not usually that high so the heat is bearable although the UV index may be very high. The average total precipitation for a year is between 16 -18 inches or 420 -440mm with most of it coming in July as rain. Fall is very colorful with red, orange and yellow leaves dotting the landscape. It is also one of the best times to ride - the footing is usually dry, the heat is gone, the bugs are at a minimum and the scenery is gorgeous. The dust in the air from harvest turns the full moon a strange shade of orange but can also cause people's allergies to flare.The grass begins to brown and the cows get restless and start to look for greener grass on the other side of the fence, so we have to keep them moving to a fresh pasture fairly regularly. We miss the long days of summer and soon find there is no daylight to work outside in the evenings. Snow is coming and there is much to do to be ready for the day the great white blanket covers up all the jobs that will be waiting next spring. 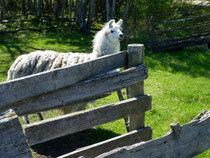 We have Appaloosa, Quarter Horse, Arabian, Welsh and miniatures here on the ranch. We use our horses for ranch work - moving cattle, cutting, roping, fixing fences and putting out salt and minerals. 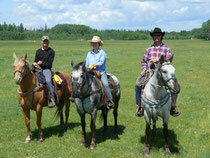 We also give riding lessons - beginners Western & English, Western gymkhana, English jumping and do some trail riding. Kelly has also been involved with a Youth group that teaches young people leadership skills and riding. We occasionally drive some of the horses and are teaching the minis about driving. So it is possible to learn to drive a horse while you are at Winning Ways. How long we work in a day depends on what the job is and how good/bad the weather is. Normally we can quit before dark in the summer & fall. In the spring we finish the last evening check of the calving cows at dark which is about 9:30 - 10:00 pm. If you are doing something that can be finished tomorrow then you can quit and return the next day. On the other hand if there are 100 head of cattle in the pen, you don't quit until all 100 have been looked after. Ranching is really a 24/7 profession but there are times when you can organize the chores so only one person is needed to look after things while the rest of the crew goes somewhere. We try to make sure that our volunteers get to do fun things nearly every day (something they enjoy--like riding, hiking, sky watching, photography), frequently while we are doing our everyday chores. We usually do something at least once a week with our volunteers for fun (a trail ride, trip off the ranch or get together with friends), and we encourage them to go occasionally on their own for recreation--fishing, swimming, camping, to the cinema, etc. This is not a job, it is a lifestyle. We try to have fun and enjoy ourselves as we get our work done. If you want to shower or meditate in the a.m. then you can get up earlier but most of us get up at 7 a.m.
Breakfast is highly recommended (you never know when your next meal may be available, so start the day right!) Everyone prepares their own except when we have a volunteer who wants to feed the crew (sometimes Kelly makes porridge but other suggestions are gladly accepted). Winter: We’re outside between 8-9 a.m. to do the morning feeding and check on the stock. [not ‘til 9 a.m. at the winter solstice when the sun does not appear until about that time]. We can then start on the day’s activities—feeding a particular group of animals, treating sick animals, fixing fences, working with young horses, snow removal or other yard chores. Calving Season: We’re out early to saddle up and go check on which cows have or are having a calf (sometimes Kelly gets up at 4-4.30am if she thinks there will be a problem). If there are no problems we simply record the numbers so that we can identify the calves; if we have tags left over from the day before we try to catch those calves and get them tagged. If there is a cow with a difficult presentation we try to help or contact the veterinarian to assist us. Sometimes we take a ‘coffee break’ mid-morning and then go for lunch a little later. Lunch can vary from 12 noon to 3p.m.—whoever is finished their outside work first, starts the soup or what ever is on the menu for lunch, unless of course, we have a designated cook. After lunch we may have a short nap (time permitting) and then go back outside. Sometimes we head off to town to pick up mail, groceries, fuel and whatever else we need. Our helpers are welcome to come along and go shopping if they need something. In the spring we usually ride right after lunch because that is the warmest part of the day. Later on in calving season this turns into the mid-day calving check. Calving Season: We do an evening check usually about 9 p.m. to check the cows one last time before we retire for the day. We do not have a T.V. in the house but the ‘neighbour’ next door has a T.V. and a satellite receiver so if you like to watch shows he’s glad to have company.